In this tutorial I will teach you how to use arrays. What is an Array ? An array is a set of variables which you can declare in a single statement. For example if you want to make a result calculating program you need to declare the total number of students first. So instead of declaring student1, student2 etc you can write int students; in this way we declared 40 variables in a single statement. the #define statement is used to declare a constant variable. Now writing the main function. We will declare variables for taking input, counters for loops and index variable to track the index of the array. Then finally we will declare and array using the constant SIZE variable that has a value of 1000. 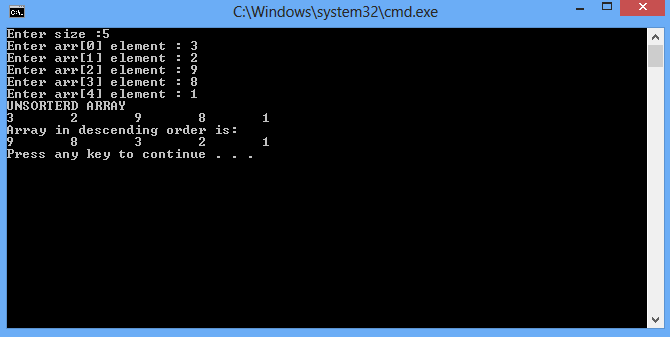 Running a for loop to take the input in array variable. We will enter the element one by one on every iteration of the loop. Now to sort the numbers we will run two loops. We will compare each number with all the numbers in the array and then adjust it’s position accordingly in descending order. So first of all making 2 nested loops outer one running form 0 to ONE LESS THAN INDEX and inner one running from outer loop counter value to ONE LESS THAN INDEX. After that we simply write an if condition that if the 1st value is less than the second value then store it in temporary variable and swap it with the greater number. After that store the temporary variable back to the variable which is picked up. So what we do is we simply compare each number in array with the complete array and if the number is less we simply swap. will run a loop to print our already sorted array and then we end our program.